TRUE VALUE Investor Seth Klarman gives a wonderful interview courteous of Alpha Magazine. For the full interview visit Alpha Magazine here. "We're not the stereotypical hedge fund in terms of an idea a minute. We come in with a view that a security is trading for less than it’s worth, and we buy it." How did you decide value investing was for you? I was fortunate enough when I was a junior in college — and then when I graduated from college — to work for Max Heine and Michael Price at Mutual Shares [a mutual fund founded in 1949]. Their value philosophy is very similar to the value philosophy we follow at Baupost. So I learned the business from two of the best, which was better than anything you could ever get from a textbook or a classroom. Warren Buffett once wrote that the concept of value investing is like an inoculation- — it either takes or it doesn’t — and when you explain to somebody what it is and how it works and why it works and show them the returns, either they get it or they don’t. Ultimately, it needs to fit your character. If you have a need for action, if you want to be involved in the new and exciting technological breakthroughs of our time, that’s great, but you’re not a value investor and you shouldn’t be one. If you are predisposed to be patient and disciplined, and you psychologically like the idea of buying bargains, then you’re likely to be good at it. Putting his money where his mouth is, Buffett recently disclosed a bet saying that a group of hedge funds, after fees, would fail to outperform the S&P 500 index. Most of you will remember Buffett's references in the 2006 annual report about all the little "helpers" in the hedge fund world that are slowly taking a piece of the pie. Carol Loomis, long-time Buffett friend and editor of the annual reports, broke the news about this bet in Fortune. The link is below. Expounding that weekend on the transaction and management costs borne by investors, Buffett offered to bet any taker $1 million that over 10 years and after fees, the performance of an S&P index fund would beat 10 hedge funds that any opponent might choose. Some time later he repeated the offer, adding that since he hadn't been taken up on the bet, he must be right in his thinking. 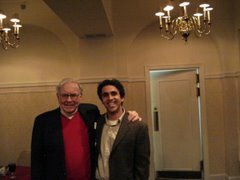 But in July 2007, Ted Seides, a principal of Protégé but speaking for himself at that point, wrote Buffett to say he'd like to make the bet - or at least some version of it. While the above categorization does make sense, it's far too rigid today to be taken as the definitive method for distinguishing between the two types of stocks. Newer studies now look at various other metrics such as price to cash flow, price to earnings, etc. in trying to separate the two classes of stock for research purposes. According to these studies, the performance of value investing has vastly outperformed a growth oriented approach. I have always felt that value and growth are merely two sides of the same coin when it comes to investing. Growth is simply a lever that creates value over time. I think the idea behind this article and the many others that prove that value beats growth is that with value investing, the aim is to pay as little as possible for that future growth. Businesses that are selling for close to the value of tangible assets, high cash flow yields, etc. will experience a dramatic expansion in multiples as they begin to demonstrate sound operating results. "To invest successfully over a lifetime does not require a stratospheric IQ, unusual business insights, or inside information. What's needed is a sound intellectual framework for making decisions and the ability to keep emotions from corroding that framework." Below are excerpts from the article followed by the link to the whole article. Judging "value" on the basis of a single financial metric such as book-to-market value was criticized for being too parochial. So, the academic community began to incorporate other relative valuation methods, such as price to cash flow, price to earnings, price to tangible book value and others. Despite the excellent performance of growth stocks in the 1990s, Chan and Lakonishok show that large-cap value stocks actually outperformed large cap growth by 12.2 per cent annually from 1990 until 2001. The same was true from 1969 until 2001, with value outperforming growth by 10.4 per cent per year. The small-cap numbers were even more impressive. From 1990 until 2001, value outperformed growth by 19.4 per cent annually. The long-term outperformance number from 1969 until 2001 for this group was 16.5 per cent. Chan and Lakonishok also argue that value stocks are no riskier than growth stocks. They show that even in down markets, value stocks suffered less than growth stocks -- an important litmus test for investors. At the end of their study, Chan and Lakonishock subtly conclude that the difference in value and growth returns is largely a result of irrational investor behaviour -- a persistent human trait that they argue will continue to reward patient value investors for a long time to come.